Below is the message of Br. Ricky Laguda FSC regarding the incident that happened last August 31, 2013 when Ateneo Coach Bo Perasol was teased by Jonathan "JJ" Atayde, a Lasallian alumnus saying thank you to him that DLSU won. It happened right after the DLSU vs. ADMU Men's Basketball Game where DLSU won (66-64). This is the Letter of Apology of Jonathan "JJ" Atayde, a Lasallian alumnus. According to @UAAPSportsTV Twitter post: "ADMU coach Bo Perasol slapped a 1-game suspension. DLSU supporter JJ Atayde banned for the rest of the season." 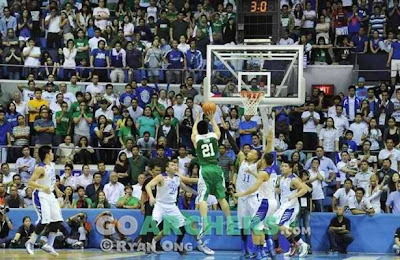 DLSU versus ADMU basketball games have always inflamed passions, both positively and negatively. The most recent encounter resulted in an unfortunate incident involving a La Salle alumnus, Mr. JJ Atayde. Below is his letter of apology that I am sharing with all of you. I have accepted his apology and remarked that his expressed regret and contrition for his action is in consonance with our core values of faith, service, and communion in mission. As we move forward and as we find ourselves engaged in many more activities that will enhance the Animo of our school, I invite everyone to always remember that each one of us is a living embodiment of everything that makes us Lasallian. I am confident that as Lasallians we can showcase what is best in us all by remaining “magnanimous in victory and gracious in defeat", not only in sports, but in life in general. Animo La Salle!